CHICAGO (jGLi) – The recent death of my first cousin (on my maternal side), Milagros “Yangos” or “Young Goose” Garra Chua, of Matnog, Sorsogon in the Philippines of lung cancer left some of my relatives scratching their heads when she decided before she died that she wanted to be cremated. Like a typical closely-knit Roman Catholics, our extended family has never considered cremation as an option until Young Goose’s decision. Cremation is a dreaded word that is better left unspoken. Among its main objections is its perceived denial of the resurrection of one’s body as shown by Jesus, who was given a traditional burial, not cremation, after the Crucifixion before He could rise from the dead. Young Goose’s only child, Dave Simon G. Chua, told me in an email that it was his Mom’s decision to be cremated. But Dave did not tell me the reason or reasons for his Mom’s decision. But I got an idea from Chicago, Illinois’ Consul General Leo Herrera-Lim: it is cheaper. The top Chicago Filipino diplomat told me the cost of shipping human remains from Chicago to the Philippines alone comes in the range of US$4,000 to US$6,000 while shipping cremated ashes could be less than US$1,000. (Note: You can lose an arm and a leg if you try to smuggle an urn containing cremated remains by stuffing it in an airline baggage or in Balikbayan boxes and get caught!) That’s why more Filipino Americans prefer to be buried in the U.S. than in the Philippines because it is costly for their loved ones to ship their remains unless they bought life or burial insurance! I emailed the customer service of Loyola Plans Consolidated, Inc. in Makati City in the Philippines, requesting for the comparative rates for cremation and traditional burial after it provided cremation service to Yangos. But I did not get an answer. The National Funeral Directors Association in the United States says the average funeral cost in the U.S. is about US$6,500 and the average associated cost for buying a burial plot, funeral flowers and services can add up to US$10,000. On the other hand, the Cremation Association of North America says the average cost of cremation is $1,600 but could reach $5,000. But cremation is usually 80 percent less expensive than a traditional burial. But if cremation services such as coffin, complete funeral, an ornate urn and visitation hours may cost as much as burial. One of my second cousins, Ramon “Tamoy” Garra, also of Matnog who is now an OFW (Overseas Filipino Worker) in Saudi Arabia and close to Young Goose family, asked me in an email, if the “(cremation) was orally willed by Yangos? According to Wikipedia, the Roman Catholic Church discourages cremation because, aside from denying the resurrection of the holy body, the body, as the instrument through which the sacraments are received, is itself a sacramental, holy object; and that as an integral part of the human person,it should be disposed of in a way that honors and reverences it, and many early practices involved with disposal of dead bodies were viewed as pagan in origin or an insult to the body. But cremation was, in fact, never forbidden in and of itself; even in Medieval Europe, where there were multitudes of corpses simultaneously present, such as after a battle, after pestilence or famine, and there was an imminent fear of diseases spreading from the corpses, since individual burials with digging graves would take too long and body decomposition would begin before all the corpses had been interred. But cremation is now permitted as long as it is not done to express a refusal to believe in the resurrection of the body. Once the Mass itself is concluded, the body could be cremated and a second service could be held at the crematorium or cemetery where the cremated remains are to be interred just as for a body burial. Dave told me he brought the ashes of his Mom home. Inurnment at the columbary will be on the 40th day also at the Loyola Commonwealth. Inurnment is the process of placing cremated remains in an urn. The urn is placed either above the ground in a niche, or below ground in a grave. As early as Dec. 30, Dave emailed me, saying, “My mother is still fighting the happy battle together with God. She’s slowly regaining her appetite and physical strength but unfortunately we cannot prevent other complications to arise because of her illness. Her feet are beginning to swell “nagmamanas” possibly due to kidney failure. We put our trust in God with everything my mother is going through that He will continue to give her that fighting courage and spirit to fight the happy battle. “Thank you very much for all your prayers and concern! Keep in touch! By Monday (Manila time), Jan. 2, my other first cousin (Rosario “Sayong” Garra Burgos) emailed me, “Kaninang 6 a.m. iniwan na tayo ni” Yangos. (At 6 a.m., Yangos left us.) “Hindi me makatulog kaya pala. (That’s why I could not sleep.) (At) 7 a.m., tumawag c Manoy Uyi at nag text daw c Dave na wala na Ma2 n’ya.” (At 7 a.m., Jorge (elder brother of Yangos) called me, telling me Dave texted him his Mom is gone.). Yangos is survived by Dave, Dave’s wife, Jackie, their two-year-old son, Danny, Yangos’ elder sisters, Panching and Belen and elder brother, Jorge. Her husband, Danny Chua, died five years ago. Yangos was the youngest daughter of the late Dominador G. Garra, a retired treasurer of Matnog and elder brother of my late mother, Consolacion Garra Lariosa. Yangos studied education at University of Santo Tomas and celebrated her 62nd birthday last Dec. 21st. She worked at the real estate department of the Social Security System in Quezon City for a long time. In my last phone conversation late last year with Yangos whom I had not seen in more than 50 years, she blamed her smoking habit and her lifestyle for her lung cancer. Bulan Observer wishes the town of Bulan as well as its readers, authors and contributors a Happy New year! We have unspoiled twelve months before us, hence, this first day of the year is the right time to be optimistic. After all those festive moments and weeks of rest and reflection, we prepare ourselves now for the things to come in our town and in our nation. We will continue with our own little ways of making known to a greater public what is happening in Bulan even as we also share our opinions on things that are happening on the national level. We have seen some goals achieved with the latest developments on the national level. For this, we thank President Aquino for realizing our goal of making corrupt public officials accountable. Some of these big crocodiles are now behind bars. Now, we expect the smaller provincial crocodiles to be held accountable also to the mess they have done to our town and province. But of course the President has his priorities. I’m thinking about the Sendong- ravaged villages in the south as top on his list of finding those perpetrators of illegal logging and mining and poor local planning that degraded the environment and endangered the lives of many inhabitants there. Remember that these illegal activities are also happening in Bulan, Matnog, etc. So we’ll keep our eyes on these things and hope that corrupt officials in our province also be put to justice. I’m following closely Chief Justice Corona’s case. Personally, I think he already lost his office for he no longer enjoys public trust. His fight which is reduced to legal technicalities will never win him that integrity and moral ascendancy expected of a Chief Justice. Mr. Miguel Zubiri went home early to take off his Arroyo clothes before the public could do it for him, and this makes him wiser than Mr. Corona who never realizes that his Arroyo wardrobe is too weak to protect him from the winds of change that’s now in our country. Soon, the senate impeachment court will be his dressing room where he will be undressed cloth for cloth- eight Arroyo clothings, I guess,- till the bare truth comes out. May this year 2012 be an interesting and brilliant year for Bulan. Bulan Observer hopes for more interesting articles written by people from Bulan themselves. My special thanks this year goes to Mr. Joseph Lariosa for his reports and for introducing Bulan Observer to our Kababayans in Chicago. May he writes more political commentaries and opinion articles. CHICAGO (jGLi) – The children of Ronnie L. Rey do not really need to call United States First Lady Michelle Obama to track Santa Claus thru the North American Aerospace Defense Command. 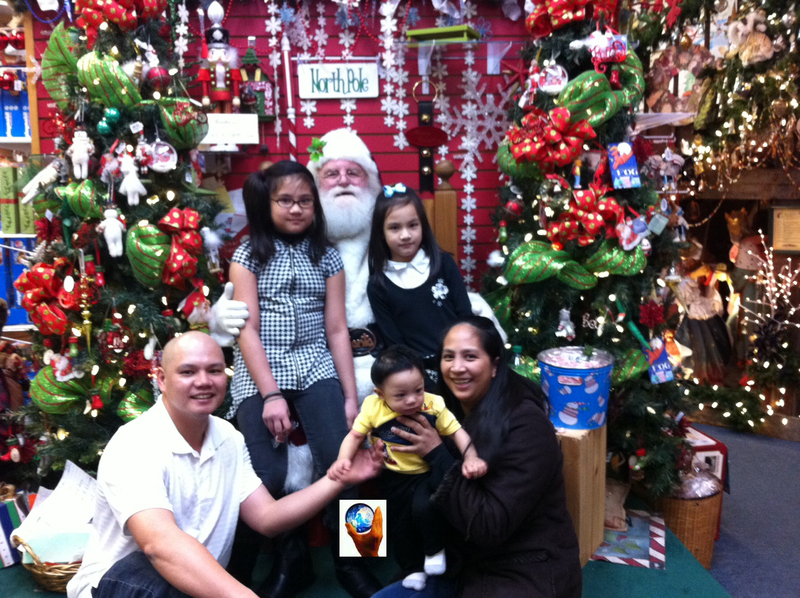 They can actually visit Father Christmas in the North Pole as shown in the photo that Ronnie, my nephew, sent me. We are are talking, of course, about the town of North Pole, Alaska, which is 15 miles from Fairbanks, Alaska, where Mr. Rey’s family lives. We are not talking about the geographic North Pole, which is 1,122 nautical miles (2,078 km) from Point Barrow, Alaska (the northernmost point of land in the United States), where the average temperature is -30 degrees Fahrenheit. Mr. Rey, a Technical Sergeant at the Eielson Air Force Base in Fairbanks, said they went to the town of North Pole last Dec. 22 when the weather was “tolerable,” which was minus 2 degrees Fahrenheit or minus 19 degrees Centigrade or Celsius. On Christmas Day, which was also his 34th birthday, Tech. Sgt. Rey just stayed at home with his family, including his wife, Contessa, 34, and their children, Angel Haven, 9, Ashley, 7, and Aiden, seven months old, although he has invitation to have nochebuena (good night), a traditional family dinner, from other Filipino Americans in the city. He said the temperature was minus 16 degrees Fahrenheit, which is minus 19 degrees Centigrade or Celsius. With population of 30,224 in 2010, Fairbanks has a racial makeup of 66.67% White, 13.10% Black or African American, 9.91% Native American, 2.72% Asian, 0.54% Pacific Islander, 2.45% from other races, and 6.57% from two or more races. The biggest attraction of Fairbank’s suburban town of North Pole is a gift shop named Santa Claus House, the modern-day incarnation of a trading post established in the town’s early days. The Santa Claus House is known for the world’s largest fiberglass statue of Santa Claus outside. Prior to Christmas each year, the United States Postal Service post office in North Pole receives hundreds of thousands of letters to Santa Claus, and thousands more from people wanting the town’s postmark on their Christmas greeting cards to their families. It advertises the ZIP code 99705 as the ZIP code of Santa Claus. Despite its cold weather, Filipinos in Fairbanks still celebrate Simbang Gabi, a novena celebrated in the Philippines nine days before Christmas. In Ronnie Rey’s case, he attends the mass in the chapel inside the Eielson Air Force Base, home of the 354th Fighter Wing, with some Filipinos but the mass is in English since there is no Filipino priest. The tradition of Simbang Gabi dates to the 1600s in the Philippines. It traces its origins to Mexico, to a monastic monk by the name of Fray Diego de Soria. He is said to have received Vatican permission to hold an outdoor Mass at dawn for Christmas, to accommodate all the people. It evolved into the novena tradition of holding an early morning Mass on each of the nine days before Christmas. These Masses were called the “Misa de Gallo,” Spanish for “Mass at the rooster call.” Having Mass at such an early time in the morning helped people embrace the penitential spirit of Advent. Because dawn comes so late in the day in Alaska, Filipinos and other Catholics in the state celebrate Simbang Gabi in the evening. Simbang Gabi is also a time for the faithful to pray for their special intentions. In Ronnie’s case, because he will be transferring for six months from his Logistics, Readiness Squadron in Eielson Air Force Base to Qatar Al Udeid Air Base west of Doha starting on Jan 7, he had prayed for his safety and his family he will be leaving behind. His family first relocated at the Eielson Air Force Base last July 2010. His tour of duty in that base will be up until June 2014, when he will be relocated elsewhere. During their nochebuena, Ronnie’s family treated themselves at home to spaghetti pasta and dinuguan (pork blood stew). “Meron din nag-iimbita sa amin sa isang handaan ng mga Filipino. Pero dahil sa lamig, dito na lang kami sa bahay namin nag-dinner.” (We got some invitation to attend a party with some Filipino friends but the cold weather prevented us from going out of our house. So, we just had our dinner in our house), Ronnie told this reporter and his relatives over the phone while his relatives were also celebrating Christmas dinner and reunion in the house of his cousin, George L. Hernandez, in Chicago, Illinois. Born in Manila and raised in Sorsogon City in the Philippines, Ronnie is a son of the former Antonia Garra Lariosa and Rolando Rey, both of Sorsogon City.